← The Best Ever DNF ! We hadn’t planned to go Geocaching on Monday but after a long weekend gardening it seemed like a good idea. Saturday morning had seen a delivery of 15 60L bags of potting compost, six sacks of granite chippings, three sacks of top soil, three sacks of horticultural sand, six large potted shrubs, assorted giant stone pots and the miserable driver had muttered ‘curbside delivery only’. Thankfully his young helper whispered that he didn’t mind taking the stones and soil further up the driveway much to the disgust of the driver. It was lovely having our front garden, driveway and patio paved but now we needed to put the finishing touches to it and unfortunately Cockrobbinn was out of action – I did wonder whether he had planned it or not?? – having had an op the previous Wednesday and been forbidden to lift anything heavier than a bag of sugar for a fortnight; he wasn’t even allowed to mow the lawns !! That left muggins here to do all the work and I was desperate to have everything ship shape and Bristol fashion. By Sunday evening I was finished (we had even gone back to the nursery for ‘just one more tree’ and also three hanging baskets to complete the patio. It was well worth the sore muscles and broken finger nails to see the completed job but, wow, were those bags of chippings heavy!! ‘Just a short stroll’ I told Cockrobbinn but we ended up doing five miles and bagging 10 caches and we so enjoyed the series that once home, I straightaway emailed the CO to thank them for such an interesting walk with excellent caches (and I had a lovely email back). Watch out for the Grenades! The LG Series is based mainly on footpaths and bridleways. It covers part of Brentmoor Heath, designated SSSI, and wooded quiet footpaths near the MOD land (which is safely fenced off so you can’t go wrong!). Only about three miles from home, this area connects to Bisley and Pirbright ranges and also touches base with another series we are completing (C & S Walk) and which I mentioned in my January blog With the sound of gunfire ringing in my ears! 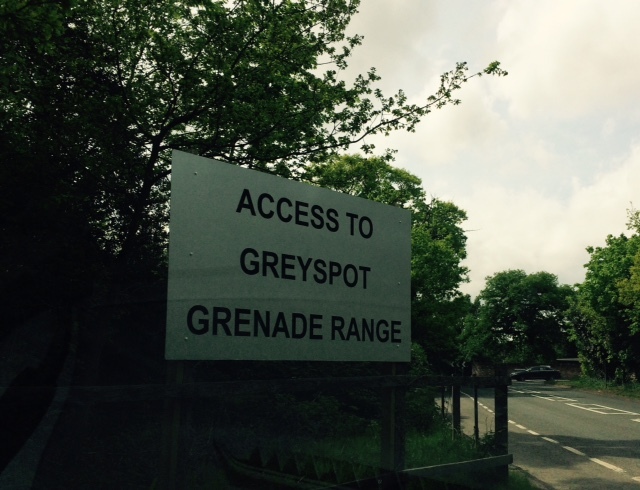 We decided to park at Greyspot which was only a few hundred metres from one of the caches. Cockrobbinn was not too happy as the road I drove up nearly removed the bottom of the car (and it was his car I was driving!!). Nevermind I told him – look at the lovely bluebells! I’m not going to list the individual caches of this series as I think it might give the game away if anyone is thinking of heading in this direction but we excitedly found our first cache nestling in a tree – very well hidden – and joy of joys, it was neither a 35mm film cannister nor a magnetic nano! This little fellow with very sharp teeth had the container cleverly hidden in his tummy. Mind you, it had to be extracted through its mouth. The CO explained later that they had set the series when her two boys were young (big lads now) and they liked caches which were a bit different from the usual – and this certainly was. It was to set the scene for the day. We signed the log and headed for the next, being quite eager to see what was to come. Before we left home, I had printed out the map from Geocaching.com showing all the local caches. Our original intention was to grab just a few then head off for some lunch but as it was a gloriously sunny day – perfect for caching so I told Cockrobbinn – I realized that we could do a circuit by grabbing five LG caches on the downward leg; this took us near the C & S Walk cache Void which had eluded us so far; then we could head back up towards where we had parked our car collecting another four caches on the way back. Look at these lovely cache containers! 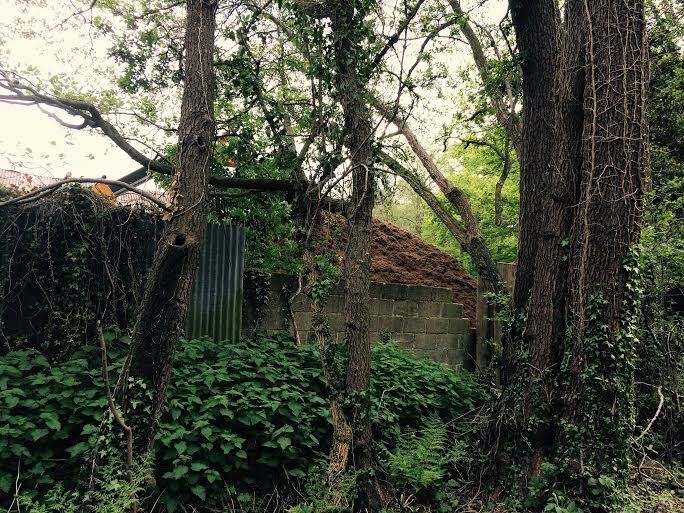 All hidden extremely well in the depths of the Surrey countryside. I won’t show them all as it would spoil the clues, but my favourite cache was hidden way up in a tree and it took a lot of maneuvering with a long stick to bring it to the ground so that we could sign the log. I won’t mention how long it took me to get it back up in the tree again! We were so close to home but in an area never before visited and when we came across a compost-making plant we were enthralled. We peeked through the gates and were amazed at the mountains of compost before us; also the smell which is not unpleasant but which reminded me of all the hard work I had done at the weekend planting my towering black bamboo and Evergreen Jasmine plants. 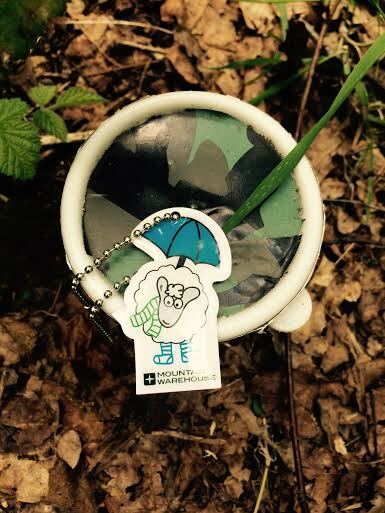 We picked up a few more caches and just before the end, came across yet another travel bug, this time in the LG series. We were only commenting to ourselves recently that we had seen no travel bugs in months and now we had found two on our little walk. We decided to retrieve this bug as well and it wasn’t until we got home and logged it online we realized that Shaun the Sheep had been placed by the same cacher who had placed the Lovebug. Oh well, Shaun will probably end up on the Isle of Wight as well. A fellow cacher, Washknight, had recently blogged about GeoFleaz which had reminded me to order some. I liked the idea of adding my own GeoFleaz to a trackable and to travel the world with it. Just hope mine arrive before I leave for the Isle of Wight. We travelled five miles in three hours – very slow for caching but a superb walk with the occasional struggle through the undergrowth when we tried to shortcut a couple of routes (my map-reading skills are not always up to scratch – haha). These caches took our total up to 275 and my trusty BodRobbinn (my trackable charger) has now travelled an amazing 8158 miles (he flew quite a bit of that). He really came in handy this trip as I ran out of battery power on my phone two caches before the end but by the time I was back at the car, I was fully charged again. An excellent buy. 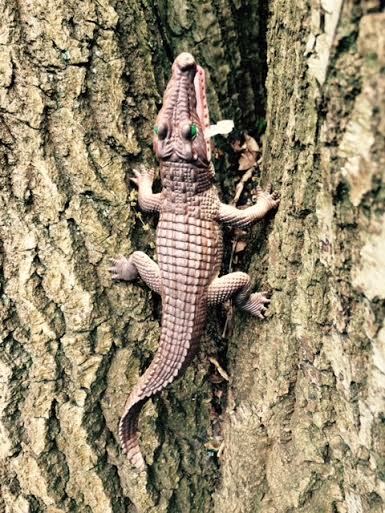 Update: Tuesday 12th May – we found the last three LG caches today although the final one almost proved to be a DNF but at the last moment we spotted the damned critter!! 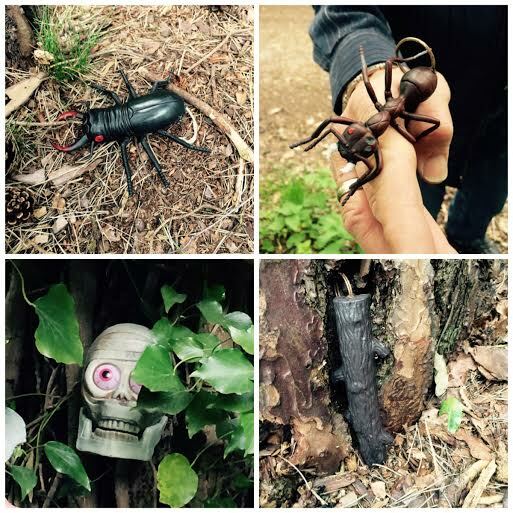 An excellent series of caches – unusual containers; not too difficult but some a little bit hard to find and a lovely walk in and around Brentmoor Heath, Colony Bog & Bagshot Heath with the sound of the army practicing in the distance. Many thanks to the Laing Gang for setting this series. Note to self: DO NOT wear cut-offs during Spring when Geocaching. There are just too many stinging nettles around at calf height. 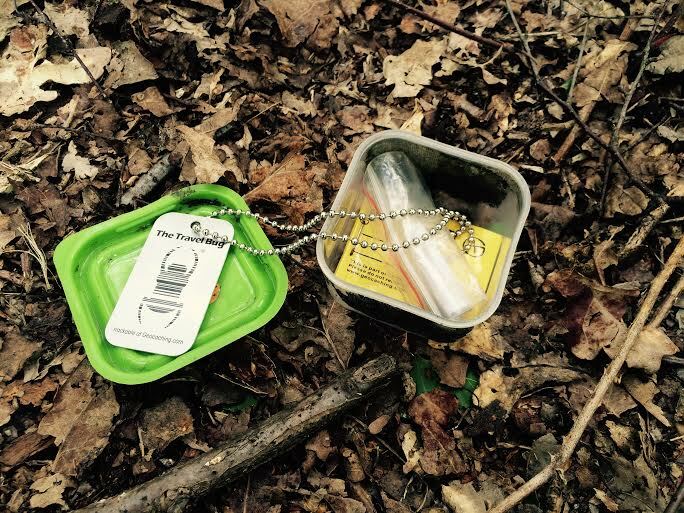 This entry was posted in Bisley, Bod Charger, Caching, Camberley, Geocaching, LG Series, MOD, Travel Bugs and tagged bisley, Bod Charger, Caching, Geocaching, Greyspot, Log Book, Travel Bug. Bookmark the permalink. You’ve got him to a T. He has a stock saying of ‘we can walk the rest of the way’ whilst I gaily steer around the holes and ruts. He forgets I used to drive a Landrover! I took my brother caching this morning, he wore shorts. You can imagine how much I laughed when I picked him up! I would have laughed too. What concerned me on our last cache was the amount of heather we had to walk through. I have a hatred of adders and there are plenty around here.